Board member since 2008. Steve Glass is currently serving as President of the OSA. 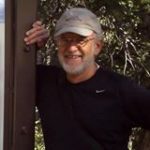 Steve graduated from NM State University in 1976 with an MS in Environmental Science and pursued a career in water and wastewater resources, until retiring from Bernalillo County in December 2011 to become a biology instructor at CNM. He continues to represent Bernalillo County on the Water Protection Advisory Board, serves as Chairman of the Ciudad Soil and Water Conservation District and has been an Open Space Trail Watch Volunteer for several years.